The first Challenge of the 2017 Challenge series is a 10 day challenge to celebrate Isaac Newton's 374th Birthday! The challenge is being offered on PrimeGrid's newest sieve, the Generalized Cullen/Woodall (Sieve) application. Come join us and help in preparations for the opening of the Generalized Cullen/Woodall LLR project some time in 2017. Sir Isaac Newton was an English physicist and mathematician (described in his own day as a "natural philosopher") who is widely recognised as one of the most influential scientists of all time and a key figure in the scientific revolution. His book Philosophiæ Naturalis Principia Mathematica ("Mathematical Principles of Natural Philosophy"), first published in 1687, laid the foundations for classical mechanics. Newton made seminal contributions to optics, and he shares credit with Gottfried Wilhelm Leibniz for the development of calculus. Newton's Principia formulated the laws of motion and universal gravitation, which dominated scientists' view of the physical universe for the next three centuries. By deriving Kepler's laws of planetary motion from his mathematical description of gravity, and then using the same principles to account for the trajectories of comets, the tides, the precession of the equinoxes, and other phenomena, Newton removed the last doubts about the validity of the heliocentric model of the Solar System. On January 4, 1643, Isaac Newton was born at Woolsthorpe Manor in the hamlet of Woolsthorpe-by-Colsterworth, in the county of Lincolnshire, England (using the "old" Julien calendar, Newton's birth date is sometimes displayed as December 25, 1642). To participate in the Challenge, please select only the Generalized Cullen/Woodall (Sieve) project in your PrimeGrid preferences section. The challenge will begin 3rd January 2017 18:00 UTC and end 13th January 2017 18:00 UTC. Scores will be kept for individuals and teams. Only work units issued AFTER 3rd January 2017 18:00 UTC and received BEFORE 13th January 2017 18:00 UTC will be considered for credit. We will be using the same scoring method as we currently use for BOINC credits. A Cullen number (first studied by Reverend James Cullen in 1905) is a number of the form n * 2^n + 1. Father James Cullen, S.J. (19 April 1867 – 7 December 1933) was born at Drogheda, County Louth, Ireland. In 1905, he taught mathematics at Mount St. Mary's College in Derbyshire and published his finding of what is now known as Cullen numbers in number theory. A Woodall number is a number of the form n * 2^n - 1. Woodall numbers were first studied by Allan J. C. Cunningham and H. J. Woodall in 1917, inspired by James Cullen's earlier study of the similarly-defined Cullen numbers. The British mathematician Allan Joseph Champneys Cunningham (Delhi 1842 – London 1928) started a military career with the East India Company's Bengal (later Royal) Engineers. During 1871–1881, he was Instructor in Mathematics at the Thomason Civil Engineering College, Roorkee. Upon returning to the United Kingdom in 1881, he continued teaching at military institutes in Chatham, Dublin and Shorncliffe. He left the army in 1891. He spent the rest of his life studying number theory. He applied his expertise to finding factors of large numbers of the form a^n ± b^n, such as Mersenne numbers (2^p − 1) and Fermat numbers (2^2^n + 1) which have b = 1. His work was continued in the Cunningham project. Herbert J. Woodall was a British mathematician. In 1925 Lt.-Col. Allan J.C. Cunningham and Woodall gathered together all that was known about the primality and factorization of such numbers and published a small book of tables. These tables collected from scattered sources the known prime factors for the bases 2 and 10 and also presented the authors' results of thirty years' work with these and the other bases. This year we are celebrating the centenary of the study of Woodall numbers! PrimeGrid is moving its search for Generalized Cullen and Generalized Woodall primes from PRPNet to BOINC. PrimeGrid will be sieving to a much larger n than has been previously done. The largest candidates will be in excess of 15,000,000 digits, and will be the same size as the largest candidates in the Seventeen or Bust project. Once PrimeGrid finds a Generalized Cullen or Woodall on a base, it stops looking for Generalized Cullen or Woodall primes on that base, depending on the type found. For all the current bases, PrimeGrid has found a Generalized Woodall prime, and will now be searching only for Generalized Cullen Primes. For detail about the bases PrimeGrid will be searching (and has searched), you can go here: http://www.primegrid.com/forum_thread.php?id=3008&nowrap=true#30718. Once the sieving is getting near optimal for 4-million digit candidates, PrimeGrid anticipates restarting LLR work as well, and would expect this to occur some time in 2017. In PrimeGrid's case, the desired elements ultimately are prime numbers and the unwanted material are composite numbers. Our tool of choice for GCW sieve is Geoffrey Reynolds' gcwsieve program. It eliminates possible candidates by removing numbers that have small factors. As this process is much faster than primality testing, it is good to thoroughly sieve a data set before primality testing. Other than all being mathematicians, is there a link between Newton and Cullen/Woodall? Message 102831 - Posted: 30 Dec 2016 | 5:25:26 UTC - in response to Message 102803. After the Greeks, little happened with the study of prime numbers until the 17th century. In 1640 Pierre de Fermat stated (without proof) Fermat's little theorem (later proved by Leibniz and Euler). Fermat's little theorem is a particularly simple example of a probabilistic test, which relies on the fact that n^p≡n (mod p) for any n if p is a prime number. Leibniz was a contemporary of Newton. They have a tangled history with Leibniz deeply interested in the new methods and conclusions of Descartes, Huygens, Newton, and Boyle. Newton shares credit with Leibniz for the development of calculus. Isaac Newton was a truly amazing mathematician and scientist. He achieved so much in his lifetime and the amount of discoveries he made can seem almost impossible. He helped make huge advancements in mathematics and created theorems that we still use heavily to this day. Although largely synonymous in the minds of the general public today with gravity and the story of the apple tree, Newton remains a giant in the minds of mathematicians everywhere (on a par with the all-time greats like Archimedes and Gauss), and he greatly influenced the subsequent path of mathematical development. Cullen numbers were first studied by Fr. James Cullen in 1905. Woodall numbers were first studied by Allan J. C. Cunningham and H. J. Woodall in 1917. Both Cullen and Woodall stood on the shoulders of the many mathematicians before them. A century since Woodall - nice to acknowledge some way. Message 102893 - Posted: 31 Dec 2016 | 7:29:38 UTC - in response to Message 102832. I have added a section about Cullen and Woodall to the Welcome post above. Message 102897 - Posted: 31 Dec 2016 | 11:20:37 UTC - in response to Message 102893. Will there be new SIEVEFILES prior to the challenge? Is there an estimation what the benefit of brand new files would be (compared to the current ones, dated Oct/Nov) - if any? Message 102901 - Posted: 31 Dec 2016 | 12:51:30 UTC - in response to Message 102897. Good question, which honestly I hadn't thought about. I normally would not necessarily have created new sieve files this soon. However, we're serious about wanting to make progress on GCW sieving and any decrease in the number of candidates will cause a (small) decrease in the sieving time. I've now created new sieves dated 20161231 and put them into production. It varies by base, but there are 3.5%-4.5% fewer entries in the newer sieves. They'll be downloaded automatically by your client (actually if your client is at all recent it'll download the much smaller .gz files and unpack them automatically). Please don't delete the older files, though, as many workunits in progress still use them. Basically, you don't have to do anything - it just works. As in the past, credit levels remain the same. Sir Isaac Newton FRS was an English physicist and mathematician who is widely recognised as one of the most influential scientists of all time and a key figure in the scientific revolution. Tact is the knack of making a point without making an enemy! I've been looking forward to this challenge. I hope that it is really able to push the leading edge of the sieve forward. Best of luck to everyone! I've changed my Computing Preference in BOINC to "Store at least 0 days of work". That way I can have a rolling start while I am asleep, wake up then increase it once the challenge has started. Message 102986 - Posted: 3 Jan 2017 | 16:02:48 UTC - in response to Message 102980. Thank you for the graphs very interesting. Do you have an idea of how much sieving needs to be done before GCW-LLR can be opened up? Message 103008 - Posted: 4 Jan 2017 | 1:07:37 UTC - in response to Message 103002. My last estimate was about 10 months worth. If we get a lot of participation in this challenge, I'm hoping we can knock 2 or 3 months off the total. If this keeps up, we're going to make a big dent in the sieving we need to do before being able to open up GCW-LLR. The amount of processing power being brought to bear on this challenge is astounding. I'm running a Haswell Core i5 -- not a Skylake, but not exactly ancient either -- and I'm currently in 236th place. Message 103036 - Posted: 4 Jan 2017 | 19:01:31 UTC - in response to Message 103035. My observations so far are this challenge is more about quantity over quality. There isn't so much performance penalty for older hardware, so just throw what you have at it! Message 103037 - Posted: 4 Jan 2017 | 19:27:28 UTC - in response to Message 103035. Message 103045 - Posted: 4 Jan 2017 | 23:37:24 UTC - in response to Message 103037.
is unclear to me either. would be a quantum leap forward, not ? Message 103046 - Posted: 4 Jan 2017 | 23:40:42 UTC - in response to Message 103045. I recall reading someone here on PG who had offered a draft outline for a GPU version of TRP Sieve. Message 103052 - Posted: 5 Jan 2017 | 2:31:02 UTC - in response to Message 103045. Only certain types of programs work well with GPU architectures. PPS sieve and CW Sieve (the base-2 version of GCW sieve) lend themselves well to working on a GPU. GCW Sieve (Base >2) and specific-K sieves (TRP-sieve, ESP-Sieve) do not. Or at least nobody has yet been able to figure out how to write an efficient GPU program for those sieves. Message 103057 - Posted: 5 Jan 2017 | 5:12:33 UTC - in response to Message 103045. I discovered, after creating PPS Sieve, that it is relatively similar to GCW-Sieve, and could be adapted for base 2 only without much difficulty. Adapting it for other bases is harder. First, you have to multiply by those other bases, not 2. And division is not an option, I think. 1. Just jump 1 N at a time. Slow, but it should work. 2. If the list could be gotten into the GPU, at least small jumps should be possible. Any X where B^X < min(P) should work identically for all factors P. Texture memory seems like the place to stick this list. There might be better ways, but I haven't though of them yet. Performance would probably be an order of magnitude slower than base 2 was, either way. A sieve for constant K requires a completely different algorithm. Probably Pollard Rho subdivided into blocks, so that it can terminate early. Message 103058 - Posted: 5 Jan 2017 | 5:47:38 UTC - in response to Message 103057. I've always assumed, probably erroneously, that the sieves all use modular arithmetic to determine if p divides k*b^n+/-1. Is this not the case? Message 103081 - Posted: 5 Jan 2017 | 14:39:13 UTC - in response to Message 103058. The funny thing about GCW Sieve is its form is n*b^n+/-1. So it's really neither fixed-K nor fixed-N. The current algorithm acts like fixed-N, iterating through n's really fast, skipping those with known factors, and only looking for k==n. Message 103104 - Posted: 5 Jan 2017 | 16:36:29 UTC - in response to Message 103081. What about other values of b which are powers of 2 (e.g. 4, 8, 16)? If you use bit shifts and other bit manipulations in your algorithm, you should be able to modify it quite easily for such values of b and still keep it fast. Message 103107 - Posted: 5 Jan 2017 | 16:51:47 UTC - in response to Message 103104. True. But none of those bases are being searched right now. Edit: That's a good point about the sieving, though. We're searching for k*b^n where k=n. But if n is divisible by d, then finding a factor p for k=n/d means k*b^n == (n/d)*(b^d)^(n/d). So p factors a different GC/W number of base b^d. Once you have a k for a given p that's less than n (really n/2 at least), this is an easy thing to check for: check if k is a factor of n. So this could be an easy extension of any GCW sieving. The tough part might be organizing all these extra factors. Edit2: I guess this would mean skipping fewer n's, so it would slow the search some. So far, there are 2438 hosts with 20265 cores participating in the challenge. That's an average of 8.3 cores per host, 4.1 computers per user, and 34.3 cores per user. Message 103118 - Posted: 5 Jan 2017 | 18:15:35 UTC - in response to Message 103112. Message 103119 - Posted: 5 Jan 2017 | 18:36:13 UTC - in response to Message 103118. There's hex-core Core i7s (12 HT cores), plus there's all the servers with LOTS of cores. There's quite a few with 64, even more with 32, and at least one with 128. Plus lots more with not-power-of-2 cores. Each of those pull the average up a lot more than a Core i5 will pull the average down. That makes up for their smaller numbers. I would guess that the Core i7 is the most popular CPU used at PrimeGrid, and it has 8 HT cores (at least the most common versions), so it's not at all surprising that the average is close to 8. Message 103179 - Posted: 6 Jan 2017 | 17:57:28 UTC - in response to Message 103112. So far, there are 2632 hosts (up from 2438 yesterday) with 22094 cores (up from 20265 yesterday) participating in the challenge. 656 users (up from 591). 121 teams (up from 112). That's an average of 8.4 cores per host (up from 8.3), 4.0 computers per user (down from 4.1), and 30.9 cores per user (down from 34.3). Participation in this challenge is incredible. At the start of the challenge, the leading edges of the GCW sieves varied from 8T to 20T, depending on the base. The leading edges, after three days of the challenge, are at 13T to 34T. Message 103236 - Posted: 7 Jan 2017 | 9:57:29 UTC - in response to Message 103119. "There's hex-core Core i7s (12 HT cores)"
Yesterday, "invalid" and "inconclusive" were not zero. It turns out that for whatever reason, the output files from the sieve are occasionally getting corrupted, perhaps by BOINC starting and stopping the sieve, but we really don't know. Jim went and made the validation a bit smarter so it can ignore the corruption in the output files and validate those tasks if they're otherwise correct. A lot of us are in very tight races in this challenge. Every task counts. Thanks Jim! Message 103251 - Posted: 7 Jan 2017 | 18:15:28 UTC - in response to Message 103179. There are 2801 hosts (up from 2632 yesterday) with 23528 cores (up from 22094 yesterday) participating in the challenge. 717 users (up from 656). 129 teams (up from 121). That's an average of 8.4 cores per host (same as yesterday), 3.9 computers per user (down from 4.0), and 32.8 cores per user (up from 30.9). We're now at a full 10x times normal daily volume. Keep it up! Message 103256 - Posted: 7 Jan 2017 | 21:16:30 UTC - in response to Message 103251. Message 103263 - Posted: 8 Jan 2017 | 5:31:15 UTC - in response to Message 103036. Message 103283 - Posted: 8 Jan 2017 | 18:16:15 UTC - in response to Message 103251. There are 2960 hosts (up from 2801 yesterday) with 24825 cores (up from 23528 yesterday) participating in the challenge. 757 users (up from 717). 134 teams (up from 129). That's an average of 8.4 cores per host (same as yesterday), 3.9 computers per user (same as yesterday), and 32.8 cores per user (also the same as yesterday). I know, from reading their forums, that at least two of the top teams are fighting furiously to be on top, with new members and new computers coming on line to participate. The results reflect that: we're running at over 10x normal daily traffic on GCW-Sieve, which is absolutely fantastic. We've already done more sieving during the challenge than was done in the prior 2+ months since we opened the sieve. The person, NeuralMiner, at the top of the leader board, first joined PrimeGrid after the challenge started! First of all, welcome to PrimeGrid! Secondly, with all that computer power, you may single-handedly push the Gridcoin team to the top of the leaderboards. With 5 days to go, it's going to be close. By far this is the most participation I've seen for a challenge, in terms of raw computer power. Since we switched to giving the top 300 people points several years ago, I've never personally not made the top 300. For this challenge, I was slipping downwards towards 300, and probably wouldn't have made the cut without firing up every derelict computer I could find. (I'm even running an N550 Atom CPU now. It's only two tasks per day, but every task counts!) This is the fun thing about running a CPU-Sieve challenge. GPUs don't count. AVX doesn't count. All CPUs can participate, and even the slow computers add up and make a difference. Now, if you'll excuse me, I need to take my wife to MicroCenter for her birthday present. :) The fact that there's a Broadwell CPU inside is pure coincidence. Really. Message 103291 - Posted: 8 Jan 2017 | 21:03:48 UTC - in response to Message 103283. For this challenge, I was slipping downwards towards 300, and probably wouldn't have made the cut without firing up every derelict computer I could find. (I'm even running an N550 Atom CPU now. It's only two tasks per day, but every task counts!) This is the fun thing about running a CPU-Sieve challenge. GPUs don't count. AVX doesn't count. All CPUs can participate, and even the slow computers add up and make a difference. If you'd hand out work-units for PowerPC I'd go and buy more multiple socket-outlets and a network switch to attach a dual-core G5 plus some G4 and G3 machines. With all the stuff already running inside my small apartment the additional tiny little bit of noise should be nothing! Hope you had fun at your coincidental visit to MicroCenter. Drove right by the closest microcenter to me this morning (around 2 hours drive from me), but they weren't open yet.. Was taking a friend to the airport and it was 7am, but they don't opem until 11am. Love that place. Message 103296 - Posted: 8 Jan 2017 | 21:27:55 UTC - in response to Message 103291. I don't think PowerPC has an 80-bit FPU. And I think that kind of matters for this sieve. Maybe others too; I'm not sure. Message 103301 - Posted: 8 Jan 2017 | 22:30:53 UTC - in response to Message 103296. You can try to play with __float128 type, maybe you will be able to make it working. For more details see https://gcc.gnu.org/wiki/Ieee128PowerPC. Message 103305 - Posted: 8 Jan 2017 | 22:55:07 UTC - in response to Message 103283. Message 103306 - Posted: 8 Jan 2017 | 22:58:40 UTC - in response to Message 103305. Aaaaaand after days of hanging out in the 190's I've finally fallen below 200 and I have no more hardware to throw at this except for a laptop with an extremely questionable cooling fan. I think this will be the last challenge for the Athlon II X4 635 based system. The CPU and motherboard are almost 7 years old and were in mothballs from late 2012 until this past fall. I'm actually surprised it still works at all. But now it's time to shut it down, sell it off, and enjoy a cooler place, lower electric bill, and a few dollars in my pocket. Congrats on the new laptop for the wife, Mr. Goetz. New hardware is always fun. Message 103317 - Posted: 9 Jan 2017 | 3:14:59 UTC - in response to Message 103313. I am throwing just about everything I own at this and I'm still being passed by. It is 15f / -9c out and my house is 69f inside. Upstate NY here. The computers are heating my house, hardly burning any fuel oil at all. I have 1 more motherboard with CPUs laying around, running out of places to put them. Message 103318 - Posted: 9 Jan 2017 | 3:43:14 UTC - in response to Message 103317. I calculated that to make the top 300, currently you need to be doing about 77 tasks per day, and that's likely to go up somewhat as people add more computers. As someone participating in the challenge, it's nerve-wracking. As an administrator of PrimeGird, it's absolutely fantastic. This challenge has surpassed my wildest dreams. Usually anything related to prime number searches is like watching the grass grow. But we're really making significant progress on this sieve. If this was a 20 day challenge we'd possibly be able to get all 14 bases to optimal depth for opening GCW-LLR, or at least be fairly close to it. Message 103320 - Posted: 9 Jan 2017 | 5:44:06 UTC - in response to Message 103317. It's mid-summer here, and I accidentally clicked BOINC instead of TeXworks (they're next to each other on my menu bar). I saw the announcement, and figured it would be a good test of my new computer. I'm running an i5-6400 with 8GB of RAM. The tasks seem to being completed in about 75 minutes each. So that's good, I guess? I've looked at some other people's computers and tasks (thank you for not hiding them in your profile!) and that's a few minutes slower than an i5-4570k, for example. Anyhow, the challenge is proving that my cooling is working! Message 103325 - Posted: 9 Jan 2017 | 11:31:32 UTC - in response to Message 103318. If this was a 20 day challenge we'd possibly be able to get all 14 bases to optimal depth for opening GCW-LLR, or at least be fairly close to it. How about checking with everyone if we should extend to 20 days? I am in either way! Message 103329 - Posted: 9 Jan 2017 | 12:58:26 UTC - in response to Message 103325. I think changing the challenge terms now would upset a LOT of people and isn't going to happen. People could stay on after the challenge, for cleanup or in general anyway. For fun I worked out what proportion of top currently ranked contributors are as a proportion of the total challenge output. I'm guessing a lot will move on after the end so rate will drop significantly. Michael has previously said the challenge is running over 10x normal rates. So very roughly, if things went back to normal rates afterwards, instead of 10 extra days it would be around 100 extra days to do an optimal sieve. A few months doesn't seem too bad and leaves plenty of time to get LLR running before the challenge in August. Message 103330 - Posted: 9 Jan 2017 | 13:40:02 UTC - in response to Message 103329. I think changing the challenge terms now would upset a LOT of people and isn't going to happen. You know from our own team forum how people are doing everything they can to get "just a few more cores" running on this challenge. Read the SG, CNT, or CEVGA forums and you'll see exactly the same thing. You'll also see that this is being treaed as a sprint, not a marathon, and the lengths that people are going to aren't sustainable. For example, I'm running a lot of laptops right now (4, in fact), and you know how I feel about crunching on laptops. Two of those machines are obsolete and would be powered off if it wasn't for the challenge -- and the other two I don't really want to subject to another 10 days of full time crunching with the associated heat and full-time battery charging. Let's not forget that changing the rules in the middle of a game isn't at all fair, and we'd only do that in an emergency. We might make a challenge shorter for example, if we found that the server couldn't handle it, but not longer. And, finally, this would be Roger's call, not mine, so I'm passing the buck. :) But I wouldn't even bother asking people. There's a 100% chance that there will be some people who would be very unhappy with such a change. Message 103331 - Posted: 9 Jan 2017 | 13:45:46 UTC - in response to Message 103330. There's a 100% chance that there will be some people who would be very unhappy with such a change. Okay, no problem. Understood on all points and no real argument from me. Message 103338 - Posted: 9 Jan 2017 | 15:36:08 UTC - in response to Message 103318. Message 103339 - Posted: 9 Jan 2017 | 16:07:54 UTC - in response to Message 103318. This challenge has surpassed my wildest dreams. Usually anything related to prime number searches is like watching the grass grow. But we're really making significant progress on this sieve. If this was a 20 day challenge we'd possibly be able to get all 14 bases to optimal depth for opening GCW-LLR, or at least be fairly close to it. I'm really hoping there is similar interest and attention to the SoB challenge in March. I really want to see that competed in my lifetime. Message 103340 - Posted: 9 Jan 2017 | 16:43:50 UTC - in response to Message 103339. I hope so too. And I think it will if the double check is going by then and workunit sizes are smaller. The smaller units will be much more manageable on older/less capable hardware. Message 103344 - Posted: 9 Jan 2017 | 18:16:39 UTC - in response to Message 103340. I suspect the participation will be just as enthusiastic, but please don't forget that GCW sieve is well suited for running on older hardware. LLR is not. Atom netbook: 4 tasks every... no estimate, just the theme music from "Jeopardy"
The AVX/AVX2 machines would run at roughly the same rates as they run the sieve, but the older computers would run much, much slower. So while there's lots of old hardware making meaningful contributions in the current challenge, that won't be the case in the PSP and SoB challenges. There are 3117 hosts (up from 2960 yesterday) with 25855 cores (up from 24825 yesterday) participating in the challenge. 798 users (up from 757). 140 teams (up from 134). That's an average of 8.3 cores per host (down from 8.4 yesterday), 3.9 computers per user (same as yesterday), and 32.4 cores per user (down from 32.8 yesterday). During the first 6 days of the challenge we have completed 124.9% as much sieving as was done prior to the start of the challenge (2+ months). Message 103348 - Posted: 9 Jan 2017 | 18:53:09 UTC - in response to Message 103344. Message 103361 - Posted: 9 Jan 2017 | 22:16:01 UTC - in response to Message 103330. Challenge length is fixed and won't be changing. How can Users plan to participate in Challenges if the goal posts move during the Challenge. Participation in this Challenge has been awesome. Message 103369 - Posted: 10 Jan 2017 | 0:14:04 UTC - in response to Message 103361. I saw "optimal depth" mentioned few times here, and that would be achieved in a few months. Does it mean that you will suspend GCW-Sieve when it will be reached, it is is optimal depth to start GCW-LLR project? Message 103374 - Posted: 10 Jan 2017 | 0:40:23 UTC - in response to Message 103369. Optimal depth is defined by the relationship between the speed of the sieve finding factors vs. the speed of testing candidates individually with LLR. But it takes a lot longer to test 12345678*2^12345678+1 than it does to test 1234*2^1234+1, right? So how do you make the comparison? You compare the sieve speed against testing which candidates? What we're doing is (arbitrarily) deciding that when the sieve is the same speed as testing a 4 million digit GCW, we will have done enough sieving to feel confident that we're sufficiently sieved to start testing the candidates with LLR on BOINC. But we won't stop sieving at that point. Although our starting point is with candidates of up to 4 million digits, we're creating a sieve/candidate file with candidates of up to 15 million digits. Since those candidates take a lot longer to test with LLR, that means that sieving remains an efficient option for a lot longer. So it will probably be worthwhile to continue sieving for a few more years after we start running LLR. My wife's new HP laptop has something called "HP Coolsense". It seems the laptop has an accelerometer. Coolsense uses this to determine whether the laptop is on a stable surface, or whether the laptop is on, you know, an actual lap. It seems to also have additional temperature sensors on the case itself. If it determines the laptop is on your lap, it will be more aggressive about keeping the case temperatures down. This can, of course, affect processing speed. This feature can be easily turned off, but whether you want to or not is another question. I'm not going to turn it off on my wife's laptop. She's already angry at me for leaving the car's seat warmers on! Coming up on 7 days, and the difference between first and second place in the team standings is less than 160K. That's out of 76 million, or about 0.2%. Seven days done. Three to go! There are 3274 hosts (up from 3117 yesterday) with 28336 cores (up from 25855 yesterday) participating in the challenge. 825 users (up from 798). 148 teams (up from 140). That's an average of 8.7 cores per host (up from 8.3 yesterday), 4.0 computers per user (up from 3.9 yesterday), and 34.3 cores per user (up from 32.4 yesterday). With the cores per host and cores per user averages going up dramatically in just one day, I'm guessing members of the top three teams have been adding cloud servers. Yesterday I said we had done about 125% as much sieving during the challenge as we did in the 2+ months before the challenge. Today, that number is 147%. That's not a typo. In 24 hours we've sieved 22% as much as we did in over 2 months of sieving before the challenge started. and 34.3 cores per user (down from 32.4 yesterday). Message 103422 - Posted: 10 Jan 2017 | 19:01:54 UTC - in response to Message 103420. How can it be that the TRP sieve between 8 and 9 was so low ? My computer died near the beginning of the challenge (probably the motherboard). It made me incredibly sad and means that I have not been contributing into the challenge as much as I otherwise would have been. I am glad to see such fierce numbers being pushed out. Great work everyone! Message 103427 - Posted: 10 Jan 2017 | 19:39:41 UTC - in response to Message 103422. If you're asking about the very noticeable dip in the chart yesterday, yeah, I've been wondering about that myself. I don't know what the cause is. EDIT: Actually, I know exactly what that was. An enhancement to the validator caused a problem with validating TRP-Sieve tasks. It was only a problem with TRP-Sieve, and we didn't notice it for a day or two. That caused the dip in the chart. When the problem was fixed, the task rate abruptly returned to normal. Although it's not reflected in the chart, all of the affected tasks were re-validated, so no credit (or data) was lost. Message 103428 - Posted: 10 Jan 2017 | 19:41:05 UTC - in response to Message 103420. Message 103442 - Posted: 10 Jan 2017 | 20:37:40 UTC - in response to Message 103340. Message 103448 - Posted: 10 Jan 2017 | 21:48:32 UTC - in response to Message 103442. Message 103453 - Posted: 10 Jan 2017 | 22:08:04 UTC - in response to Message 103448. Message 103466 - Posted: 10 Jan 2017 | 22:54:46 UTC - in response to Message 103448. This is where I'm coming from. Given the number of years SoB has been running it'll be a very long time before all of the primes are found if there even are all of the primes to find. Message 103469 - Posted: 10 Jan 2017 | 22:59:27 UTC - in response to Message 103466. Look today CPU with AVX2 and look at computer before 10 years. Message 103474 - Posted: 10 Jan 2017 | 23:38:34 UTC - in response to Message 103469. Moore's law says that processing power doubles every 18 months. So after 40 years that future CPUs will be about 10^8 times faster, and SoB crunching time will be reduced from today's 400h to 13ms. Of course in the meantime their length would have to be increased many times (probably about 10^6), to keep their length reasonable. Message 103484 - Posted: 11 Jan 2017 | 2:01:44 UTC - in response to Message 103469. Message 103485 - Posted: 11 Jan 2017 | 2:05:47 UTC - in response to Message 103453. Maybe. That's always a complicated analysis. Ask me again after the challenge ends. Message 103512 - Posted: 11 Jan 2017 | 16:44:01 UTC - in response to Message 103448. I expect I'm more than half way through processing my task on earth, but yes, I'd like to live as long as I reasonably can. Even if I die this evening I'm still hoping the next 5 tasks returned in SoB will finish the project so I'll have lived long enough. Message 103518 - Posted: 11 Jan 2017 | 17:59:37 UTC - in response to Message 103427. There are 3440 hosts (up from 3274 yesterday) with 29840 cores (up from 28336 yesterday) participating in the challenge. 859 users (up from 825). 153 teams (up from 148). That's an average of 8.7 cores per host (same as yesterday), 4.0 computers per user (same as yesterday), and 34.7 cores per user (up from 34.3 yesterday). The team battle for 1st place has been furious. Both SETI.Germany and Aggie the Pew have changed places several times over the last few days. AtP has managed to pull out ahead by a slightly larger margin over the last couple of hours, but if the past 8 days are any indication, there may be lots more changes in the last two days. People have adding computers, and teams have been adding people, at an astounding rate, and two days is a long, long time. In the individual standings, 1st through 4th are probably safe, although there's plenty of time for surprises to happen. From 5th onward, most positions are very close, and merely being in the top 300 takes a fair amount of computing. That's the reason my house is filled with laptops that sound like hair dryers! Convinced my Mum to run BOINC for a couple of days on her computer. ... Should have seen the look on her face when I asked her. This is something quite a few of us can relate to. Replace "Mum" with "wife" or "son" and I could say the same thing. And that makes this a really good time to thank everyone. Competition aside, this challenge has a specific purpose, and that purpose is to get us ready for opening up GCW-LLR. The quote above is an example of the lengths to which people have gone to in order to make this happen. You all have our sincere gratitude for rising to the occasion in such an exemplary fashion. I could not be more proud of our community. Thank you! Message 103528 - Posted: 11 Jan 2017 | 18:44:30 UTC - in response to Message 103469. Message 103547 - Posted: 12 Jan 2017 | 4:35:27 UTC - in response to Message 103474. Moore's law is breaking down now. It's getting harder and harder to produce CPUs with smaller features, and we're near the limit of how much voltage can be reduced and still produce usable chips. So it looks like some major change will be needed for much more speedup. On the other hand, the Intel i7-5960X has been available for some time (octa-core with hyperthreading to make it look like 16 cores) and I've seen rumors about a Xeon Phi expected to be available later this year with up to 100 cores. tl;dr: GCW-Sieving for GC109 is optimal and has been turned off. Expect GC41 and GC73 to be turned off later today. Let me explain our strategy for GCW. First thing is that there's two different "optimal sieving depths". The first optimal depth is when we're sufficiently sieved for the smaller GCW candidates and can therefore start testing GCW-LLR. The second optimal depth is when we're sufficiently sieved for the largest of the GCW candidates, at which point we can suspend the sieve. For the remainder of this post when I say "optimal", I mean sufficiently sieved for starting GCW-LLR. Once GCW-LLR testing begins, there will still be a lot more sieving to do. When we start sending out GCW-LLR tasks, it will be done differently than we've been doing with GCW-LLR on PRPNet. On PRPNet, we send out a block of numbers on one base, then a block of numbers on the next base, and so on. So you might see GC13 for 100K<n<200K, then GC25 for 100K<n<200K, etc. There's two disadvantages to that approach. The task sizes tend to jump up and down, and which base you're running has a large effect on the task size. We'd prefer to keep the task sizes consistent, with the tasks slowly increasing over time. Not jumping all over the place. We will therefore be sending out GCW-LLR work in size order, sorted by the number of digits in the candidate. Like the GCW-Sieve, you'll be getting a mix of bases simultaneously. Part of this strategy implies that we can not start running LLR on some bases before the others. So even though we'll finish sieving some bases before the others, GCW-LLR won't start until all 14 bases are sufficiently sieved. Each of 14 bases is being simultaneously but independently sieved right now. Each base has a different factor density, and will therefore reach "optimal depth" at a different time. GC109 is now optimal, and GC109-Sieve task generation has been suspended. This lets us concentrate on bringing the other 13 bases to optimal depth more quickly. Also, GC41 and GC73 are close to optimal, and I expect those two to be suspended later today. We'll then continue sieving the remaining 11 bases. The other 11 have a ways to go and we won't be finishing them all during the challenge. If you had asked us a week ago if any of the bases would be optimally sieved by the end of the Challenge, the answer would have been, "No way." This is a very pleasant surprise to all of us. Thank you! Please note that although we've suspended GC109 sieve task generation, there's still a few hundred GC109 tasks in the queue, so you'll still see a few of them. The number is dropping rapidly, however: there's half as many now as there were when I started writing this. And there will, of course, be the occasional resend of tasks that have errors or time out. But mostly, we're done with GC109 for a while. There are 3541 hosts (up from 3440 yesterday) with 31384 cores (up from 29840 yesterday) participating in the challenge. 871 users (up from 859). 156 teams (up from 153). That's an average of 8.9 cores per host (up from 8.7 yesterday), 4.1 computers per user (up from 4.0 yesterday), and 36.0 cores per user (up from 34.7 yesterday). The team battle for first place seems to have widened out, but if this challenge has shown us anything, it's that there are always more computers that can be brought to bear. Aggie the Pew seems to be building a comfortable lead, but does SETI.Germany have anything left for that final push to the finish? What surprises are in store for the last 24 hours? For the individual honors, NeuralMiner seems to have a lock on 1st, unless Zunewantan has a lot of late tasks come in during the last day. From 5th place on down, however, the competition for just about every spot remains fierce. Also, GC41 and GC73 are close to optimal, and I expect those two to be suspended later today. GC41 work generation has now been turned off. Message 103616 - Posted: 13 Jan 2017 | 14:02:51 UTC - in response to Message 103580. GC73 work generation has also been turned off. GC47 and GC53 are next, but with the end of the challenge in a few hours it's hard to predict how long that will take. And the challenge is over! As well as being exceptionally productive (beyond my wildest dreams), the challenge was very exciting and I hope all of you had as much fun as I did! We did a LOT of sieving over the last 10 days. It will take a bit of analysis to determine exactly how much, but suffice it to say that we're a lot closer to opening up GCW-LLR than we were 10 days ago. Three of the 14 bases are now sufficiently sieved for us to start LLR, and another 2 are close. That will let us concentrate subsequent sieving on the remaining 9 bases, so they will proceed at an accelerated pace. The challenge cleanup now begins, and those who would like to help with the cleanup are welcome to do so. Next month is our annual "Tour de Primes" challenge, which is purely for fun and is all about finding primes instead of credit or points. Although the schedule is still somewhat tentative because we're not yet ready for the SoB DC, the next two challenges after Tour de Primes are specifically to help with the double check effort for SoB and PSP in March and April, respectively. As many of you are aware, both the original PSP and the original SoB projects have ceased operations, leaving PrimeGrid alone to continue both conjectures. Before proceeding forward, however, we want to insure that there have been no missed primes, so full double checks are being done of all old work. The PSP double check started a few months ago. The SoB double check will be starting soon. The double check tasks for both projects are (for now) a lot shorter than the typical large tasks that normally run on those projects. These two challenges will therefore have substantially shorter tasks than you might expect on PSP and especially on SoB. Happy New Year's everyone, and I hope I'll see you in February, March, and April! Approximately 63499 factors were found during the challenge. The cleanup begins! I expect the cleanup to take between 15 and 30 days. Right now, there's a couple of thousand cleanup tasks available, but they'll go out quickly. Feel free to continue to crunch GCW-Sieve if you wish to help with the sieving. The cleanup will go pretty quickly and no "special effort" is needed to help with the cleanup. 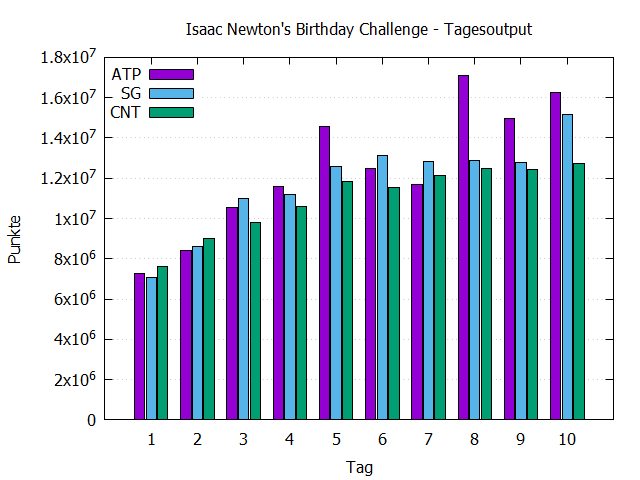 13-Jan: Isaac Newton's Birthday: 107946 tasks outstanding; 75140 affecting individual (283) scoring positions; 57602 affecting team (48) scoring positions. This turned into a really fun challenge. From some of the posts I read and Michael mentioned, folks were finding everything they could to throw at it. I think maybe a old radio shack system was even dredged up (just kidding). AtP also wants to say Well Done to Seti.Germany. We had a very spirited battle going on and it made it extremely interesting and at the same time brought out a wonderful team spirit as it should. Thanks to the admins and everyone who made this challenge run so well. Message 103646 - Posted: 13 Jan 2017 | 19:39:20 UTC - in response to Message 103642. Thanks a lot from me as well. I think I'm representing the whole Rechenkraft.net team which had a hard, but fun time to gain 8th place. Not only competing against everyone else we even made quite a fuss between some guys inside the team which lead to someone out of our team lending me his machines' crunching power, and me even firing up an old Pentium 3 Laptop (after I found its whereabouts, thus no sooner participation of this old pal) just to gain so few more credits. Message 103651 - Posted: 13 Jan 2017 | 20:19:04 UTC - in response to Message 103635. I remember seeing some inconclusive results along the way, (looking back, 2 on the first day). When the third task arrives to make a "casting vote", does it end up making one of the original inconclusive results valid and the other invalid? If not, what does happen? Message 103652 - Posted: 13 Jan 2017 | 20:21:33 UTC - in response to Message 103651. Go and read some of my earlier posts. One of them talks about an enhancement to the validator that made some previously invalid results into valid results. Message 103653 - Posted: 13 Jan 2017 | 20:29:08 UTC - in response to Message 103652. But what you're looking for is that a previously inconclusive task becomes an invalid task when the tiebreaker task is validated. Message 103654 - Posted: 13 Jan 2017 | 20:29:30 UTC - in response to Message 103561. Each of 14 bases is being simultaneously but independently sieved right now. Each base has a different factor density, and will therefore reach "optimal depth" at a different time. Would it be practical to send out numbers of sieving tasks in inverse proportion to the factor density for each base? Or would that strategy end up making sieving task durations more erratic? Or is it just plain easier to run each base at its "natural" rate and turn it off when it reaches start-optimal ? Message 103655 - Posted: 13 Jan 2017 | 20:35:03 UTC - in response to Message 103654. It will still be the same amount of work, but you're adding complexity to how it gets out. I will help with clean-up on the slow machines as I'm actually closer to GCW sv ruby than I am to TRP sv jade, so doing them in that order. Message 103660 - Posted: 13 Jan 2017 | 20:49:29 UTC - in response to Message 103653. Or even better, as Michael points out, running repairs on the validator can turn both inconclusive results into valid ones. Message 103671 - Posted: 13 Jan 2017 | 22:47:45 UTC - in response to Message 103654. It would certainly be possible, however there's nothing gained by doing this. The same amount of sieving work must be done no matter what order we do the work, so there's no reason at all to use anything other than the simplest method of distributing the work. Message 103689 - Posted: 14 Jan 2017 | 9:46:07 UTC - in response to Message 103642. Wow, that definitely turned into a much more exciting challenge than I would have expected from a 10-day short task challenge. Thanks to all who were involved! Message 103693 - Posted: 14 Jan 2017 | 12:31:07 UTC - in response to Message 103639. 14-Jan: Isaac Newton's Birthday: 63190 tasks outstanding; 38541 affecting individual (265) scoring positions; 8522 affecting team (33) scoring positions. Message 103726 - Posted: 15 Jan 2017 | 1:03:07 UTC - in response to Message 103721. You have all Intel processors with AVX, so you should do much better in future challenges. While the cleanup continues, the top 3 results are final! Message 103733 - Posted: 15 Jan 2017 | 12:36:25 UTC - in response to Message 103693. 15-Jan: Isaac Newton's Birthday: 35185 tasks outstanding; 15048 affecting individual (224) scoring positions; 3599 affecting team (16) scoring positions. 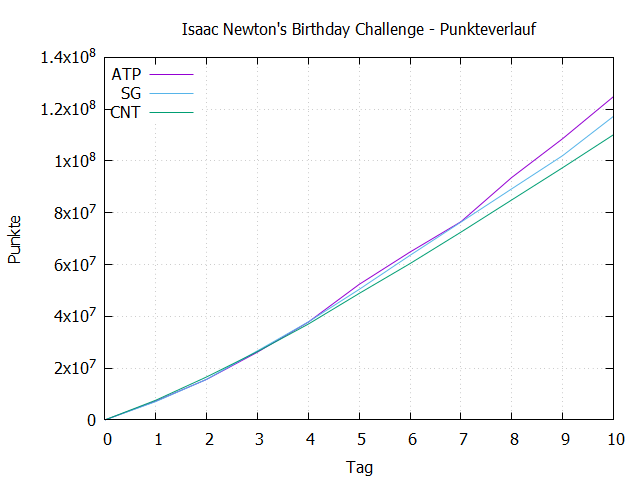 16-Jan: Isaac Newton's Birthday: 20791 tasks outstanding; 6397 affecting individual (180) scoring positions; 690 affecting team (8) scoring positions. 17-Jan: Isaac Newton's Birthday: 12229 tasks outstanding; 2874 affecting individual (138) scoring positions; 41 affecting team (4) scoring positions. 18-Jan: Isaac Newton's Birthday: 4855 tasks outstanding; 767 affecting individual (84) scoring positions; 0 affecting team (0) scoring positions. 19-Jan: Isaac Newton's Birthday: 2199 tasks outstanding; 177 affecting individual (41) scoring positions; 0 affecting team (0) scoring positions. 20-Jan: Isaac Newton's Birthday: 1272 tasks outstanding; 71 affecting individual (25) scoring positions; 0 affecting team (0) scoring positions. 21-Jan: Isaac Newton's Birthday: 695 tasks outstanding; 38 affecting individual (19) scoring positions; 0 affecting team (0) scoring positions. Message 103982 - Posted: 22 Jan 2017 | 11:03:28 UTC - in response to Message 103974. Certainly you have now eliminated three of the outstanding tasks. Applause for letting them run to completion rather than aborting them. It is a shame that your tasks were 21 or 22 hours too long to run within the challenge even if you had started them at the challenge start time. They represent another three sieves towards the target of getting the GCW search proper under way. Every task helps. Am I right in assuming yours is a Pi 3 - the latest fastest one? It is still an Arm device, I believe. I will have to try running sieves on my Tesco Hudl (officially an Android Arm device, but the kernel runs nicely with Gentoo Linux and others have run it with Debian). Message 103984 - Posted: 22 Jan 2017 | 12:42:26 UTC - in response to Message 103982. We don't have any ARM applications. He must be running an x86 emulator. It will be really, really slow. That's why a task task takes an hour or two took many days to complete. Raspberry Pis are slow, but they're not THAT slow. I'd be curious to know how much power it consumed during that marathon emulation run. Did it consume more or less power than a real x86 CPU would have consumed? It's obviously not going to be anywhere near as efficient as it would be running native ARM code, of course. Consider this an official response to the idea of using a Raspberry Pi emulator to run BOINC tasks intended for x86 CPUs: Please don't do it. As far as we're concerned we have no idea how reliable the emulator is. We don't know if it does math exactly the same way as an x86 CPU does (I'd be VERY surprised if it did). It has not been tested, As such, we can't trust its results. If you (not you personally, but the PrimeGrid user community as a whole) continues to use the emulator, we will be forced to take action to protect the system. This might mean banning such systems, or it might mean writing the validator to require that at least one task be from a real x86 CPU. (That would be similar to what we do with bad video drivers, for example.) Or we can simply always mark emulated tasks as invalid and not count them at all. Many of these options result in extra tasks being sent out. You're also annoying people running real x86 computers who have to wait for your Raspberry Pi emulation to finish. The possible solutions will require a lot of effort by either Jim or myself (or both) to implement, and that will have two effects. The first is that it will delay other stuff we're doing, such as adding new features, fixing bugs, etc. The worse problem is that you will be causing us to waste our personal time to deal with this nonsense, and thus making enemies of the people who run PrimeGrid! Every hour we spend working on PrimeGrid is an hour we're not spending with our children, our wives, our girlfriends, our families, or our friends. So please, please, please, just stop it, Okay? Message 103987 - Posted: 22 Jan 2017 | 13:33:39 UTC - in response to Message 103733. 22-Jan: Isaac Newton's Birthday: 352 tasks outstanding; 10 affecting individual (9) scoring positions; 0 affecting team (0) scoring positions. Message 103989 - Posted: 22 Jan 2017 | 13:39:20 UTC - in response to Message 103984. We don't have any ARM applications. It is a bit of give away that his computer is listed with a complete blank for CPU type. There's your first filter, Michael, should you need it! I'd be curious to know how much power it consumed during that marathon emulation run. Did it consume more or less power than a real x86 CPU would have consumed? back of an envelope stuff follows. 2000 x 25 ~ 50000 Joule ~ 50kJ. So according to my sums, it cost about 12x as much (in pounds, dollars, or carbon) to run that work on the pi as it would on a ten year old desktop x86_64. As you say, worth it for the fun, but not a good idea every day. Message 103991 - Posted: 22 Jan 2017 | 14:19:51 UTC - in response to Message 103989. Interesting. I'm surprised even an old x86 system like that is more efficient than the Pi in emulation mode. Yes, Jim and I are already looking at how to tell if a host is an ARM device masquerading as an x86 CPU. It's difficult, because any of the flags that are screaming "fake!" are actually present in a lot of legitimate hosts too. The one thing that can't be faked, however, is how slow it is. It's WAY slower than any normal host. It's likely slower that any real CPU that's actually capable of running the app. Message 103994 - Posted: 22 Jan 2017 | 14:45:11 UTC - in response to Message 103991. Now, if someone wanted to write a native ARM app for the sieve -- and one that actually works this time -- we might consider making that available officially for GCW sieve or TRP sieve. What x86 specific features does the GCW sieve actually use that are not available on ARM? It might be as simple as compiling and running the existing source on an ARM system and working round a few errors the compiler throws up. Has anyone tried the compile exercise to see what happens? Clearly this would not work with LLR or GFN, but you yourself have made the point that sieve uses few of the more modern features of the Intel/AMD cpu. we might consider making that available officially for GCW sieve or TRP sieve. But the app would need to go through our own testing before being used. And even after being released into the wild, there are so many x86 boxes on PG that it would be no hardship to set the scheduler to issue at most 1 ARM unit for each WU. If after some months they were consistently validating that would be reassuring and at some point well down the line you might trust an ARM-only pair of tasks in the validator. It was interesting to see that one out of DeleteNull's tasks fell over early on, after just over 400sec, and the other three crunched happily for about 940,000 seconds and all validated. Even before your request was posted, he had not downloaded any new work since those first four. That hints to me (but certainly does not prove) that any errors are going to crash out rather than run to completion. Message 103995 - Posted: 22 Jan 2017 | 15:02:01 UTC - in response to Message 103994. We used to have a TRP-Sieve app, written by a user, and although it appeared to work I made the mistake of taking the developer's word -- and never verified that it operated correctly. There's a bug in the code and it does everything correctly, EXCEPT finding factors. Nobody has stepped up to debug the app, so it remains broken and offline. I'm pretty sure it's just an ordinary bug, however, and there's no inherent reason why the sieve can't run on Android (or Raspberry Pi). It will be slow, but there's no reason it couldn't work. This would be very difficult. Message 104001 - Posted: 22 Jan 2017 | 17:05:33 UTC - in response to Message 103991. 2. the only possibility to run GCW-Sieve is to use a x86 emulator. 3. there wil be no native (arm) application for GCW-Sieve....until the assembler code segments will be translated form x86-assembler to arm-assember code. Message 104002 - Posted: 22 Jan 2017 | 17:27:44 UTC - in response to Message 104001. For me it was just a test if the emulator works well and it does. The results are valid. Should I test the emulator with LLR? Message 104009 - Posted: 22 Jan 2017 | 19:07:56 UTC - in response to Message 104004. Definitely not. And certainly not with live tasks. What you do on your own is your business, but please don't run live tasks on an unproven platform. While I expect the sieves to work, that's not the case with LLR or Genefer. Unless something has changed, I believe ARM doesn't implement floating point using the same IEEE standards as x86, so it's entirely possible, even likely, that LLR will produce different results in the emulator. Also, it's likely that LLR performance will make the sieve look downright speedy. It will run very, very slowly. Message 104014 - Posted: 22 Jan 2017 | 20:12:05 UTC - in response to Message 104002. It would be nice if you could provide sample input files and reference output files for them. They should be specially crafted to contain at least one factor (or prime for LLR), and small enough so app could process them fast (preferably in less than minute on modern PC). Anyone who would like to work with your code could use them to quickly check if app is still working. They also would allow to benchmark performance various app versions. Regarding conversion to ARM - if you do not use assembly or intrinsics in your code, it should be enough to recompile app for new platform. One thing which may cause problems is char signedness, on x86 it is signed and on ARM char may be unsigned, so you may have to use switch like -fsigned-char to make it signed. Another thing is endianess, fortunately ARM is by default little-endian like x86, so this should not be a problem. Message 104019 - Posted: 22 Jan 2017 | 22:22:16 UTC - in response to Message 104014. This was GCW. We had a great challenge but even so I wouldn't say we were close to the end of that yet. However, in just over 2000 tasks I got 167 factors, an average of one per 12 tasks. So you'd still expect only one third of one factor in three tasks. Michael's point is still absolutely valid even at the beginning of a sieve. I agree with this request. If producing a specially shortened task is not feasible with your other committments, perhaps you could get the server to log the parameters of the next task that finds any factors for each of the sieves running for GCW. That is an easy way to identify a simple set of test tasks. Only half of those tasks should be released for user testing, the remaining half kept back for your own initial tests so that you can test using different parameters than the ones the devs knew about. Of course that will not be your ONLY test, but it is a good initial screen that would quickly point out gross problems like those you had before. Just a suggestion - ignore it if there are hidden reasons why it would be more work than I am guessing. Message 104021 - Posted: 22 Jan 2017 | 22:37:24 UTC - in response to Message 104004. Message 104027 - Posted: 22 Jan 2017 | 23:53:48 UTC - in response to Message 104014. If someone wants to work on a native ARM sieve app, I'd be happy to provide support for their effort, including providing test cases. However, for a "laughs and giggles" test of running under an emulator, or for any attempt at an LLR or Genefer ARM app, I'm simply not going to waste my time on that. To prove it can be done, fine, knock yourselves out. Performance will never reach an acceptable level running an emulator, and LLR/Genefer simply aren't practical (and perhaps not even possible) with current ARM hardware. Message 104028 - Posted: 22 Jan 2017 | 23:58:31 UTC - in response to Message 104004. If you want to do that, then a good way might be to manually run LLR and pick some small candidates to minimise run time. You can use Top5000 site to find some. If it seems to be working well and isn't too slow, then you might try larger tests. Message 104029 - Posted: 22 Jan 2017 | 23:59:54 UTC - in response to Message 104019. Tremendous progress was made during the challenge. Most of your factors were found near the beginning of the challenge. Right now, very few factors are being found. On average, we're probably finding less than 1 factor for every 10 tasks. We're in the end stages of the sieve, but "the end stages" take a long time. So there's still a lot of sieving to do, but not that many factors to find. Message 104041 - Posted: 23 Jan 2017 | 12:40:57 UTC - in response to Message 103987. 23-Jan: Isaac Newton's Birthday: 129 tasks outstanding; 4 affecting individual (3) scoring positions; 0 affecting team (0) scoring positions. Message 104042 - Posted: 23 Jan 2017 | 12:56:25 UTC - in response to Message 104029. I just had a look at my stats and I have 11,984 tasks completed with 19,429 factors found (avg. 1.6212/task). I do recall a large number of my factors (17,000 or so) having come from the first three to four days when I parked temporarily on Gold. Edit 1: I am #5 with respect to factors found ... really good feeling. Positions #3 and #4 very much within reach (famous last words). Edit 2: I think I will pass on TDP and remain parked on GCW Sieve so as not to have any surprises with "the end stages". Sapphire first and then I will park elsewhere. Message 104044 - Posted: 23 Jan 2017 | 13:39:35 UTC - in response to Message 104042. Don't forget that factors are a lot harder to find right now. We had a ten day challenge that did more than 10x normal work, so lets say 130 days worth of sieving work was done. Based on that, let's say a total of 250 days worth of work are needed to open GCW-LLR. Opening GCW-LLR we chose to mean "sieved to optimal depth for a 4 million digit candidate". The largest candidates in the sieve file are 15 million digits. The sieve will therefore end when we're sufficiently sieved for 15 million digits. I therefore expect that sieving to 15M will take 14 times as long as sieving to 4M (15^2 / 4^2). That means a total sieve time of 3500 days, of which we've already done about 200 days of sieving. So I was wrong; it's not closer to 5 years than it is to 1 year. It's closer to 10 years than it is to 1 year. Those are, of course, very rough estimates. But it seems clear that this sieve isn't closing anytime soon. In terms of finding factors, we might be in the "end stage" of the sieve where not many factors are found, but in terms of the project, we're still at the very beginning of the sieve. Message 104045 - Posted: 23 Jan 2017 | 13:49:27 UTC - in response to Message 104044. That means a total sieve time of 3500 days, of which we've already done about 200 days of sieving. So I was wrong; it's not closer to 5 years than it is to 1 year. It's closer to 10 years than it is to 1 year. In other words, a month's digression (vis a vis TDP) is a drop in the bucket. Okay, back to the original plans with TDP during all of February. Thanks for the analysis and feedback! Message 104057 - Posted: 23 Jan 2017 | 23:40:39 UTC - in response to Message 104044. Doesn't this loudly call for a GPU sieving app? I, technically, have no clue how to realise a most efficient GPU application, but I stupidly think: We do have a GPU app for PPS sieve. Even if GCW sieve is somewhat different, the core algorithm should be similar. Sort of. But wouldn't it be worth to dig into this direction? Message 104060 - Posted: 24 Jan 2017 | 0:16:06 UTC - in response to Message 104044. Can I gently suggest that the phrase "end stages" is not a helpful one (uncharacteristically for you; your posts are usually very carefully worded, in my experience). I would suggest instead, saying that factors were plentiful in the opening stage, that the opening stage does not last long at all, and that we are now in the long mid game where factors continue to get progressively less frequent. To me the phrase "end game" seems a natural term to be used when the sieve is about as efficient as LLR at removing candidates, when you are giving people their last chance at a nearby badge, and continuing to stop on a round number like 105P instead of 104,422,445,123,325,547. Message 104071 - Posted: 24 Jan 2017 | 3:50:26 UTC - in response to Message 104057. I explained here why a GPU app for GCW sieve is hard. Message 104076 - Posted: 24 Jan 2017 | 12:17:00 UTC - in response to Message 104042. Just under twenty-four hours have passed and an opportunity to get a rough gauge as to the progress being made on a daily basis. Current rate @ 0.058 factors per unit .... Michael was spot on with "we're probably finding less than 1 factor for every 10 tasks" (ie < 0.1 factors per unit). The Challenge clean up is now complete and stats officially finalised! Thank you one and all for giving the GCW Sieve a great start. The GCW LLR project start is now within reach. When we started this challenge GC13 was completed up to Range 7T-8T, and GC109 completed up to Range 14T-15T. Now the leading edge for GC13 is up to 35T-36T, and GC109 64T-65T. Progress at this stage well beyond what we hoped for. Take a break from your usual routine and enjoy the up and coming Tour de Primes. Reach for a Jersey or search for a top 5000 Prime, it will never be as easy again as it is now.